Dreamforce (left) has beaten Invinzabeel in a thrilling finish to the Listed Winter Stakes. A couple of weeks after John Thompson thought Dreamforce had won his first stakes race, the five-year-old has delivered at Rosehill. The trainer’s reaction on Saturday was one of relief as Dreamforce held on in the Listed Winter Stakes (1400m) to beat the fast-finishing Invinzabeel by a long neck. In the Civic Stakes a fortnight ago, Dreamforce had a similar run from a wide gate and appeared to have the race in his keeping only to be nabbed by Liapari on the line to go down by a half head. “I went the early crow last time and was disappointed. It was nerve-wracking again,” Thompson said. “He is just such an honest horse and tries all the time. He’s called Rocky around the stable because he never gives up. Dreamforce, the $3.20 favourite, started from the outside gate in the 13-horse field and Brenton Avdulla steered him across to sit off stablemate and race leader Special Missile ($26). Avdulla took Dreamforce to the front in the straight with Invinzabeel ($9) his only danger. Special Missile held on to run third, 1-1/4 lengths behind the runner-up. Thompson is now aiming high with Dreamforce who he believes can be a Group One contender. “I’ll give him a freshen-up and get him ready for some of the mile races in Melbourne,” he said. “I think races like the Toorak Handicap where he will get in with a light weight will suit him. Thompson trained Gathering to win the 2010 Railway during the summer carnival. Avdulla said despite the wide barrier, Dreamforce gave him a sweet ride. “He’s a gentleman to ride,” he said. “He’s just push-button and we were able to get a breather in the middle stages. 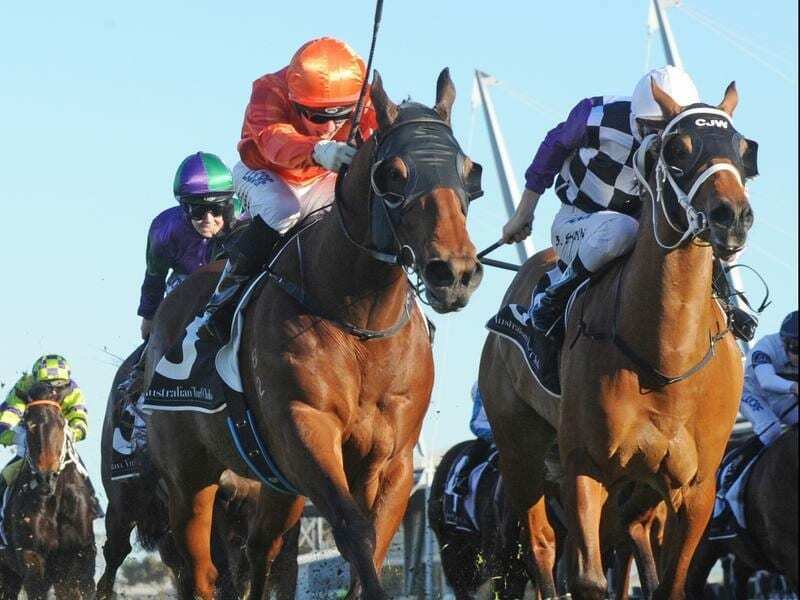 The trainer’s plans for Special Missile are more immediate and the gelding will return to Rosehill in two weeks for the Listed Winter Challenge (1500m). Special Missile has five minor placings from seven starts this preparation.